3d printing as a solution to cultural property disputes? Probably not. For worse or better, museums and collectors want ‘real’. Overview of Planche’s discussion at an event at the Club de la chasse et de la nature, Paris. 13 van Gogh’s have been stolen and recovered, 85 have been lost. 3 were stolen and have not been recovered. The paintings missing include one by Francisco Guardi and the paintings seem to have been stolen in two batches. More on the Trinity College art theft case. After a string of thefts from churches in Zacatlán, the district government is demanding more police surveillance. Thieves have targeted both everyday items and sacred art. The gang had been engaged in historic bell theft from churches throughout the region. No word if they were for sale or to be melted down. 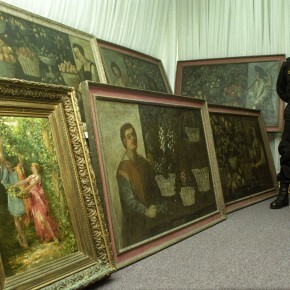 More on the 10th anniversary of the FBI Art Crime unit. The Toledo Museum of Art will voluntarily return a 450-year-old astrolabe that was likely stolen from the Gotha Museum just after WW2. The furnishings owned by Queen Liliuokalani are using old photos and newspaper reports to find lost and looted pieces and ask for their return. Norman Starks was indicted on six counts all of which relate to his removal of Native American artefacts from Federal Land. The maximum penalty he faces is 10 years in prison and a $100,000 fine. Thoughts from criminologist John Kerr. After a series of thefts of hosts and chalices, the bishop of the French diocese of Belley-Ars has ordered that the blessed sacraments be removed unless securely fastened with a lock. This is so the doors of the church can remain open for public prayer. After a provenance investigation the 8 works were returned to the heirs of Jewish publisher Rudolf Mosse. The pieces will mostly remain on loan in the Berlin State Museums. The co-owners and manager of the the Wiesbaden-based SMZ Gallery Itzhak are charged with making €11 million from the sale of 19 fake Russian avant-garde paintings. The piece by Jacob Jordaens was returned after a year of appeals by the Polish Foreign Ministry was taken at the close of WW2 and surfaced at a London auction in 2008. The library employee took engravings, lithographs, photos, and books dating to the 17th through 19th centuries. Jail time and a fine of 268,435 Euro for Manuel Fernández Castiñeiras who stole the medieval Codex Calixtinus from the Cathedral of Santiago de Compostela, Galicia. A revisit of a 2006 case, the brothers tried to sell the fake Goya to ‘an Arab sheik’ for four million euros. I don’t think anyone thought it would be easy for Bern’s Kunstmuseum. Gurlitt’s family is challenging the donation. The four works were taken from a private home and are valued at around £50k each. Police think the paintings may have been targeted. The sea god statue was recovered from Binevenagh Forest. The theft appeared to have been religiously motivated. Three temple thefts were solved and four idols were recovered in Nallakunta after the police posted a video of the thieves on Facebook and a person called in with an identification. The items were taken from a Jain Temple in Salukkai village near Vandavasi and included bronze idols of Mahaveer Jain and Thirthankar. The thieves climbed the temple wall and broke open the main gate. The idol of Lord Ardhanarisvara was stolen from an apartment in Puducherry. Other stolen items were found in the carpenter’s possession. 2 months after the major temple theft and since the recovery of the idols, the government is considering forming a protection trust to oversee security. At the moment security is the responsibility of the royal family of Kullu. The Mongolian praying monk mummy was, indeed looted, but he will be returned to his original resting place an security features will be installed to prevent repeat theft. Swatch replaced the cube in Mater’s Magnetism with a watch without asking. Beyond the issues with appropriation, Magnetism honours the Hajj and Mater now fears reprisal from Saudi Arabia’s religious police for this unauthorised use. Zabyah Al-Shaharani, a 15 year old who did the right thing and reported the neolithic tools she found to the authorities, has been given double compensation for them and a letter of thanks from president of the Saudi Commission for Tourism and Antiquities . An interview with a smuggler, a dealer, a police officer, and an archaeology official. Roughly the same info as the BBC piece but cut to have a Turkey focus. The e-registry includes artefacts from all emirates and is meant to protect the pieces and provide reliable info about them.